Mid-Life Cruising!!! : Nirvana's New Home! I can't believe it's been almost a month since my last post, especially since I've been having some exiting news for about 3 weeks. On March 10th, we FINALLY put Nirvana in a lift and got her back in the water! 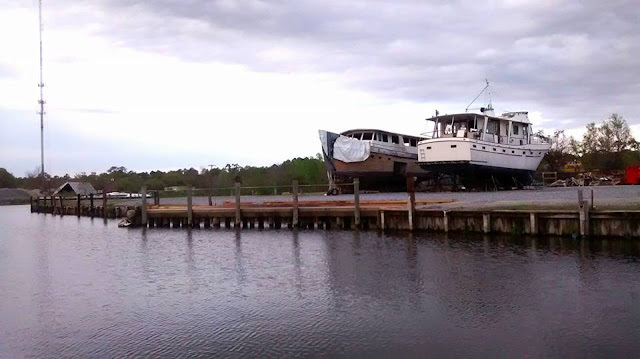 After being in the boatyard since December, 2014 ... this day couldn't come soon enough, and it was a day full of excitement and a bit of anxiety. Would we find any leaks from the thru-hulls or the last minute strut repair that kept us in the boatyard another two months? Would the engine start after sitting for over a year? Would Ken be able to easily align our new prop shaft once back in the water, or would that be another typical boat project that turns into a nightmare? Did Ken install our new shaft packing properly? Would we run aground when moving Nirvana to her new slip and look like total idiots? If we ran aground would we bend our brand new prop shaft? 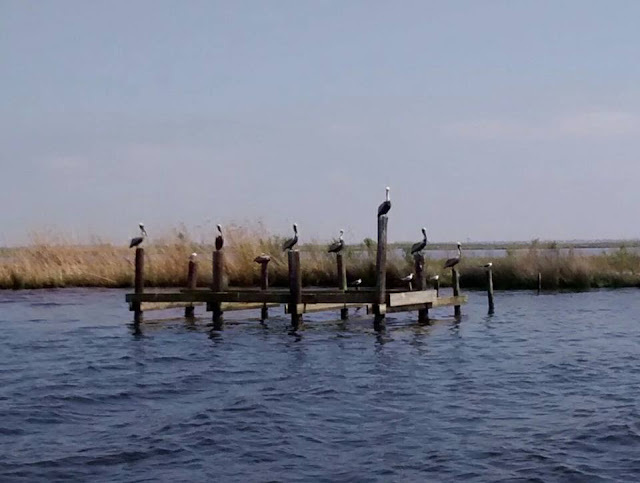 All of these questions would be answered once in the water ... and "out there" in the lake. Ya know what Capt'n Ron says! Seeing our prized possession slowly lift off the stands and into the air always makes us a little nervous. But, the straps were in the right position and Nirvana was slowly carried near the water without incident. Nirvana sat in her slings for a bit while Ken painted the areas of the bottom that the stands had prevented from being painted while on the hard. After drying, Nirvana was lowered into the water then guided to the dock for aligning the new prop shaft and checking everything one more time. Everything looked good, and nothing leaked. Whew, now on to aligning the shaft. While this didn't turn into the nightmare we feared, it did take a lot of time. As the afternoon slipped away, we decided to finish up in the morning and enjoy the next day motoring to Nirvana's new home. 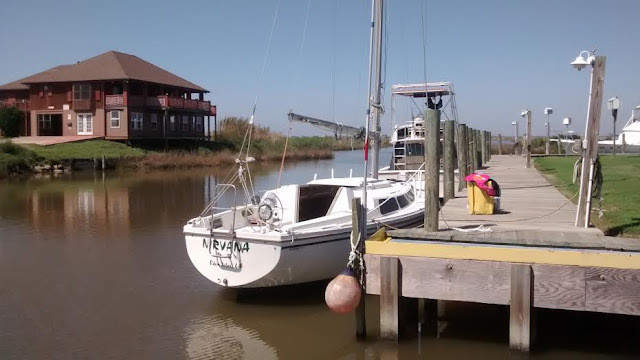 We arrived early the next morning, Ken finished aligning the shaft, and we were finally ready to start the engine and get into Lake Pontchartrain. The engine took a minute to start, but it sounded great ... music to our ears! We untied the lines and headed out of the canal and into the lake. We were anxious to see how the new shaft packing was working, so we weren't ready to celebrate and relax just yet. As we entered the lake, Ken checked the packing and made a few small adjustments. I kept watch and steered the boat while he was down below. Ken came up just as we'd floated into the center of the lake ... perfect timing. 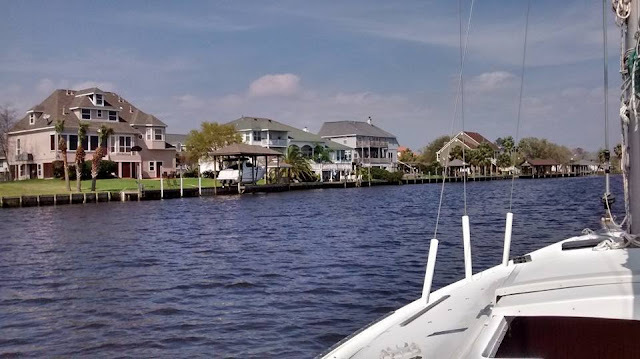 The days was gorgeous and as we motored along the lake we began to relax. 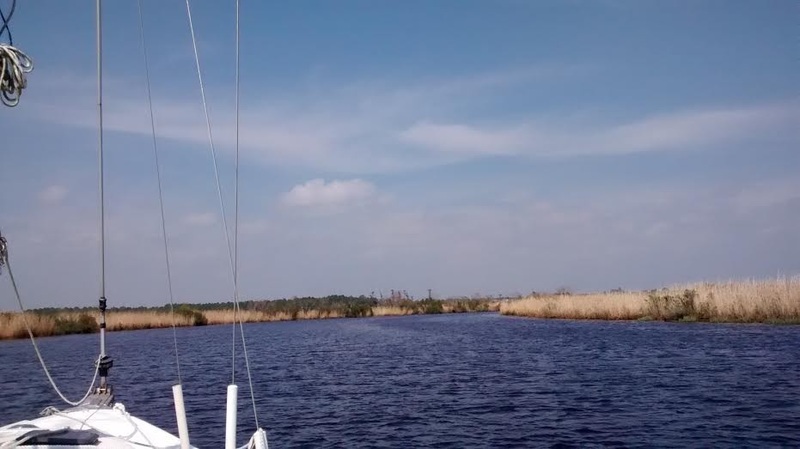 The new packing was working well, the shaft seemed to be aligned properly and was running smooth, and the engine wasn't overheating, We were back on our boat ... on the water! We felt like we were getting reacquainted with an old friend, and it felt great. Our confidence began to come back, and our love for Nirvana was quickly rekindled. What a perfect day it turned out to be! We slowly made our way across Lake Pontchartrain and into Bayou Bonfouca. The marsh is beautiful. On such a beautiful day after a lot of rain, we saw lots of turtles sunning themselves and about five alligators doing the same thing! We've grown up on the bayous and swamps, yet we rarely see an alligator. It was fun to scan the marshy areas and actually see an alligator every now and then. As we motored past beautiful homes, we knew we were getting close to Nirvana's new slip. We had two bridges to pass through. The first bridge was on the lake and the second was just before our slip. As we waited for the old bridge to open, we started running our docking procedure through our heads. After going back n forth, we decided that I'd jump on the dock and Ken would steer us into the slip bow first ... very slowly. We placed the fenders and slid right into our slip ... much easier than we'd hoped! That following Friday night, we sat in Nirvana's cockpit and enjoyed the sunset and water views with a few beers. Aaaah ... we've been away too long. The guy next to us, Octo, just moved onto his sailboat, and has been working on the interior for the past 3 years. Octo has the same plan as us ... to travel on his sailboat. He's about to start working on the outside, while we're about to start working on our inside. Octo is a real nice guy, and he said he'd be glad to adjust our fenders and keep an eye on Nirvana since he's living right next door. We exchanged numbers, and it's good to know that Nirvana is being watched. We live about 5 minutes away from Nirvana, so we're able to stop by often. I can even stop by and board Nirvana by myself ... no more dreaded ladder! We also have Noah's Ark across from us! So, why have I taken so long to share this exiting news?! Well, it seems that the past month has flown by with work and now TWO vacant rentals. We've been working on getting these rentals back on the market in our spare time. We've got one rental ready and advertised, and the other should be ready in the next 4-6 weeks. We've spent quite a bit of time showing the one rental and interviewing potential tenants, but we're being picky this time so ... it's still on the market. I can't tell ya how hard it is these days to find a decent tenant! One showed up reeking of pot and in his pajamas, another used to live there and had trashed the place (the nerve! ), and others had terrible credit and no proof of income ... ugh! Anyway, we're getting a handle on things and we've ordered the non-skid for Nirvana's deck. We hope to start this project real soon ... before the Louisiana heat & humidity becomes too uncomfortable. Also, I've been escaping to New Orleans every now and then for a beginner's sailing course! I'll have more about this later and have only sailed once so far, but it's been fun. 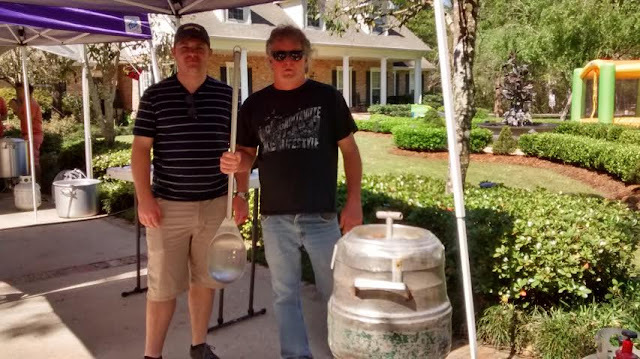 This past Sunday we took a break from everything and participated in a friend's annual Crawfish Boiling Competition. Our team consisted of Ken & I, our daughter and our son-in-law. We've won in the past, but didn't this year. 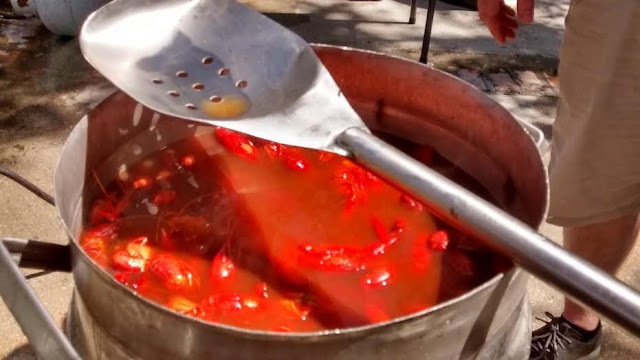 That's alright, we enjoyed the friends & crawfish and lots of folks still thought Ken's was the best. It was another gorgeous day! Now that Nirvana is back in a slip without incident, I can tell ya that there were many times during the past year that we felt defeated. 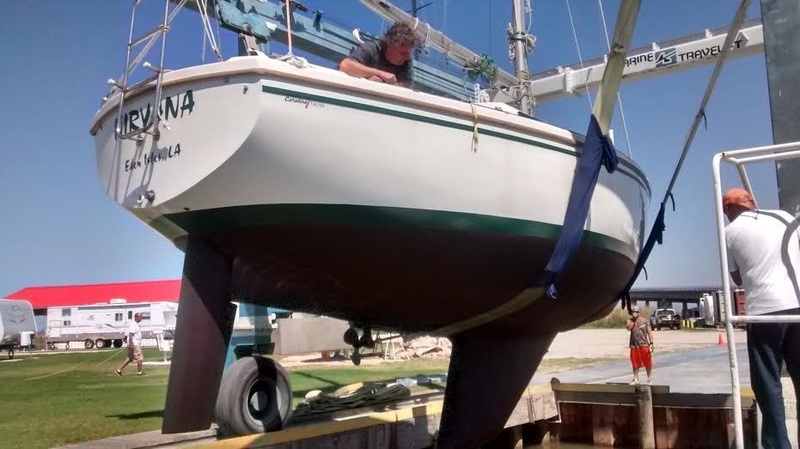 From the difficulties with spraying the deck, to the unexpected new shaft & coupling and strut repair, to Nirvana's new bottom job being out of the water too long, to low water levels keeping stuck at the boatyard ... it was a long road. We were starting to think that Nirvana was never getting outta the boatyard! When we started to feel down, we'd tell ourselves that we would get through this, and we'd feel much better once we did. A weight has been lifted and it feels so good ... we're moving forward! Glad to read this upbeat post! I know it's been a long and difficult year for you two at times, but your perseverance has paid off. I wish you luck in finding a tenant. Your trials and tribulations being landlords makes me very thankful we never took on that responsibility. I'm glad she's back in the water and you've taken your first cruise in over a year. I can't imagine not having our boat for that long. It was long enough when we did the two face lifts. So nice to see her in the water and it's great that you have such a good boat neighbor. 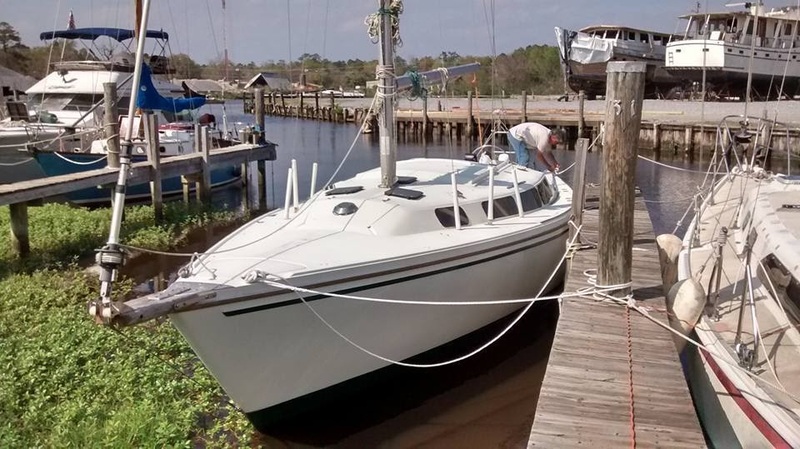 Great Story...know how you feel about getting the boat back in the water after a long spell. Whats your cruising plan ? Fair winds until next time! Just looked your location up on Google Maps - looks like a great place to be based! But what's the green weed that covers the water? Emily, thanks for following along with us for so long! It has indeed been long & difficult sometimes, and if only I could get Ken to quit his job .. LOL! I'm really hoping he makes this big change soon so we can get outta here. Rentals are definitely difficult. We'll probably have to get a property manager (maybe our daughter) when we travel, but until then we're trying to handle it ourselves. Sandee, the year seemed like an eternity! You know what it's like to be away from a boat. Thanks Ellen! We are lucky to have a great guy living right next door! Gerry, those 10 years will fly by but I know what you mean about wanting to get out there. We've been at this for over 6 years. What were we thinking when we thought we'd cruise in 2011?! Keith & Nicki, Southern Louisiana is indeed great place. I was born & raised in the New Orleans area, and now live about 25 minutes away. The "green weed" is just some floating grass .. LOL!